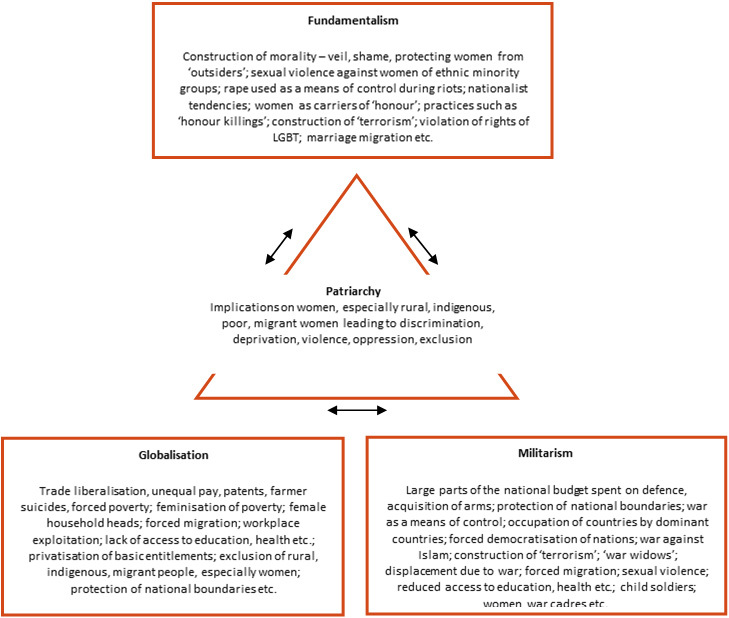 Globalisation, Fundamentalism and Militarism (GFM) are three forces that have control and harmfully affect people’s and especially women’s lives. In the Asia Pacific, these forces manifest as expressions of the ideology of Patriarchy, the overarching belief that men have ascendancy and power over women’s lives. APWLD has developed and deepened the analysis of GFM and applies these to critiques of development policies, political and legal systems, economic and military actions, regional agenda-setting and global policy actions. Globalisation is the phenomenon of mass movements of people and goods across borders and throughout the globe, facilitated by policies that prioritise trade liberalisation, deregulation, privatisation and minimal regulation. The impact of these neoliberal policies have been viewed as bringing economic growth, in reality they have not improved standards of living or advanced human rights for a majority of the world’s poor. Research by APWLD and others suggests that unconstrained neo-liberalism has exacerbated the gap between rich and poor, and in many cases, has led to further feminisation of poverty. Fundamentalism. APWLD uses the term ‘fundamentalism’ to refer to monolithic, rigid narratives adopted by movements in efforts to gain power, particularly through deployment of cultural, religious, ethnic and nationalist discourses. These movements are distinct from other movements in that the power they seek is absolute and in opposition to plurality, difference, debate or dissent. In the context of culture/religious-based fundamentalisms, power is inevitably and most easily exercised by targeting women, through regulation of their bodies, roles, freedoms and rights. Women’s lives are the most circumscribed and restricted by fundamentalist agendas. Women are given the roles of representing honour and also custodians of community honour, so they become particularly vulnerable to violence and repression when they are perceived to be acting outside of boundaries set by the fundamentalist forces. Militarism, and the process of militarisation, is a system that builds up military power, practices and institutions in a society, and is often used to establish dominance over the civilian. Armed conflict, the threat of armed conflict and the militarisation of societies effects women in a multitude of ways– both as an immediate consequence of hostilities and the legacy of militarisation that makes it harder for women to claim their human rights. The Asia Pacific region is experiencing increasing militarisation the consequences of which include displacement, massacres, mass rapes, mass detention and torture, loss of crops, higher infant and maternal mortality, extrajudicial and summary executions. Since 2001, many countries have adopted the US’ stance of a “War on Terror” and have used this to justify increasing militarisation. Anti-Terrorism Laws have been added to Internal Security Acts to legalise political attacks and repression against opposition, critiques and dissenters, including human rights defenders and organisations. Globalisation, fundamentalism and militarism intersect with patriarchy to limit the full realisation of women’s rights in Asia Pacific. We strive to interrogate, document and contest practices that undermine the realisation of women’s rights.